Ask fellow campers about "Lake Ahquabi State Park" and nearby attractions. Only trash emptied was the big blue dumpster when it was overflowing. Two open trash barrels half full of trash attracting many flies. Flies everywhere. Mosquitoes at night. No cleaning of bathroom rooms, showers, or fire pits. No security lighting except of lights above entry ways into shower house. We camped at Lake Ahquabi State Park in a Motorhome. Indianola less than 10 minutes away with great eating/dining choices. The roads and sites are very tight and not conducive for big rigs. We moved four different times to get a semi-level site which still maxed out our leveling system. Difficult to get satellite. Park people were nice. We camped at Lake Ahquabi State Park in a Motorhome. This is a very nice, clean park which we really enjoyed. The sites are easy to get into and fairly spacious. The park is on a beautiful lake with many activities including hiking trails, fishing, boat rentals and swimming. We stayed here over labor day weekend and although the park was full, it didn't feel crowded. The restrooms were clean and well maintained. Will definitely stay here again when passing through. We camped at Lake Ahquabi State Park in a Travel Trailer. Plenty of room to hike and bike. Be careful on the upper camping area, the turns on the west side on very tight. Cutbacks have affected Iowa campgrounds as some of the picnic areas are not being mowed, just paths to and around them. We camped at Lake Ahquabi State Park in a Fifth Wheel. Wonderful, quiet campground. Shade trees at lots of the sites. Playground is not directly in the campground, but a little ways away. 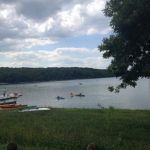 There is a beach at the lake and there is also canoe, kayak and paddle boat rentals. Very clean and yes, the DNR drives through frequently. Lots of white tail deer to see. We camped at Lake Ahquabi State Park in a Travel Trailer. Beautiful campground with lake views. Electric only hookups. Campground is patroled by the DNR (quite visible). Great family atmosphere. We have stayed here several times. In the summer months a naturalist gives programs on the weekends. There is a beach adjacent to the camping area. Be sure to arrive early or have a reservation, as the park is a popular weekend destination. Only downfall for the park is lack of full hookups, and the shower houses are in need of a update. We camped at Lake Ahquabi State Park in a Fifth Wheel. This is a beautiful state park about 20 miles south of Des Moines. The lake view sites have no hookups, but we were in the first row of electric sites up from the lake, and had a great view of the lake and plenty of shade. There is a beach and covered fish dock in the park. DNR was very visible, so no wild parties going on! My only complaint was the lack of hot water in the showers. We camped at Lake Ahquabi State Park in a Travel Trailer. Are you affiliated with Lake Ahquabi State Park ?